Manchester United lost the FA Cup Final on Saturday to a spirited Chelsea side that were resolute for 95 minutes but United struggled to create clear-cut goalscoring chances to beat The Blues. The Red Devils were looking to win their third trophy under Jose Mourinho since he took over in 2016 but a first half goal by Eden Hazard proved to be the difference in the clash at the Wembley stadium. A number of United players were below par, but fans reserved the brunt of their criticism for teenage English forward, Marcus Rashford. The 20-year-old academy graduate started the game as United’s striker after Romelu Lukaku failed to prove his 100% match fitness ahead of the clash. 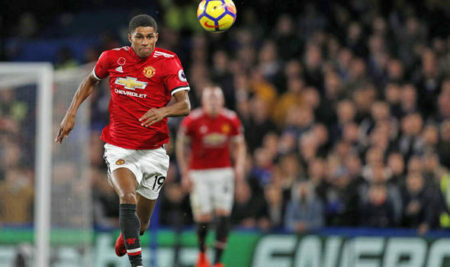 However, Rashford struggled to justify why his manager trusted him to play the important game, as he delivered one of his worst games this term. He huffed and puffed to no avail, consistently losing the ball to the opposition and lacking none of his quality that was expected to threaten the Chelsea backline. He failed to get in behind the defence and offered no threat before being substituted for Romelu Lukaku in the 73rd minute as United chased the equalizer. Below are some of what United fans said about his performance. No need of buy-back clause. United headed into the game as slight favorites after Chelsea’s recent slump but a number of the Chelsea players played the games of their lives, defending in numbers and had an inspired Thibaut Courtois to thank on many occasions. Rashford started the season well but tailed off at the middle of the campaign as Alexis Sanchez became first choice following his arrival from Arsenal in the January transfer window. He has been named in the England squad for the World Cup, but to have an impact on the mundial, he must add consistency and intensity to his game. Why all the furore over Rashford, the Manager must take the blame for yesterday, probably only Smalling Matic were without blame. I say sack the Manager immediately, he has spent enough already, and quite honestly fed up with boring tactics. kindly loan @Rashford19 out to gain more experience @lease for a season n leave @Martial11 for us. You would have to be mad to sell Rashford, under a different manager he would quickly prove how good he is. Mourinho is incapable of improving or helping him to improve his game, one of the reason he is supposed to be at United. Get rid of Mourinho is the key to many United players reaching their potential. Mourinho should have to be blame not Rashford nor any player.. Take a look at Liverpool boys Klopp is using to United, United have better squad than them but Klopp has manage to take them to CL final. Mourinho is playing useless tactics and outcake football and you’re here blaming the boys.. If he don’t change that tactics, we can’t win any major trophy under his boring defensive football..